A note from Lindsey: The synopsis portion of this review contains mild spoilers. Eve Gill (Jane Wyman) is an aspiring stage actress rehearsing for a new production at the Royal Academy of Dramatic Arts. In the middle of one of her rehearsals, she is interrupted by her frantic friend Jonathan (Richard Todd), who is also an actor. 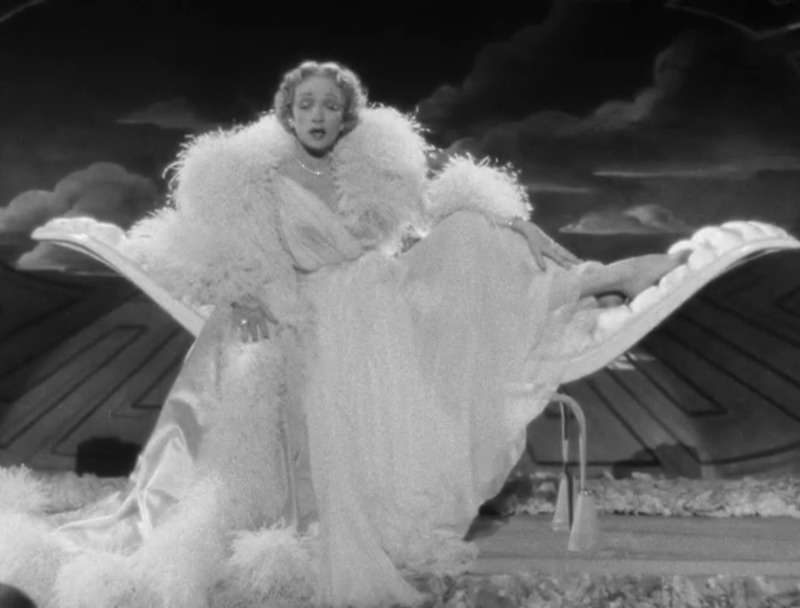 Jonathan has been having a secret romance with an established, glamorous, married actress named Charlotte (Marlene Dietrich). Jonathan is in a panic because Charlotte has come to him and admitted that she killed her husband. She’s got blood on her dress to prove it. Jonathan agrees to go back to her house and grab a new dress for her so no one will see her wearing the bloody clothes, but he’s caught in the house by Charlotte’s maid. So he’s on the run, and he wants Eve to help him. Eve cares for Jonathan greatly and is more than willing to help, agreeing to let him hide in a house that her father (Alastair Sim) owns. But she decides to go even further than allowing him a hiding place. She decides to put her acting skills to use (first as a reporter, later as a maid with a thick Cockney accent) and investigate the crime for herself, hoping to uncover the truth about the death of Charlotte’s husband and clear Jonathan’s name. Alfred Hitchcock directs Stage Fright (1950), a dramatic thriller centered around the world of the London stage. Writing credits are given to Whitfield Cook, Alma Reville and James Bridie. The film is based on a novel by Selwyn Jepson. One of Hitchcock’s lesser-known works, Stage Fright is often either forgotten or criticized by fans of his work. As a fan of Hitchcock and leading lady Jane Wyman, my expectations were very high going into this despite some of the negative things I’ve read about it. Admittedly, it does start out a bit… off. It isn’t completely dull, but it isn’t as high on drama as it could have been either, especially since we’re immediately launched into a flashback detailing how Jonathan got involved in the murder. But the pace soon picks up a bit, and there are a number of things that work in this film’s favor. The black and white cinematography is beautiful. Though not quite as visually striking as some of Hitchcock’s other films, there’s still a great use of shadow and an interesting shot variety. Jane Wyman is also very good. It’s hard to see why her character would help Jonathan at all since he accuses her of being jealous of Charlotte and doesn’t seem to appreciate her help in the beginning, but Jane still succeeds in getting the viewer on her character’s side because she seems so purely good-hearted. She and her father seem to be the only characters interested in finding the truth. Jonathan is perfectly content to take the fall for the crime as long as he can hide away, and we don’t really get the police perspective. I’ve read that neither Dietrich nor Hitchcock really liked Wyman for the role, but as a fan of her I think she gives a very good performance here. Perhaps this is why Dietrich (who also gives a very strong individual performance, as expected) and Wyman play so well against each other: there was off-camera tension to bolster the tension between their characters. The biggest thing the film has going for it, though, is the fact that it isn’t afraid to lie to the audience. 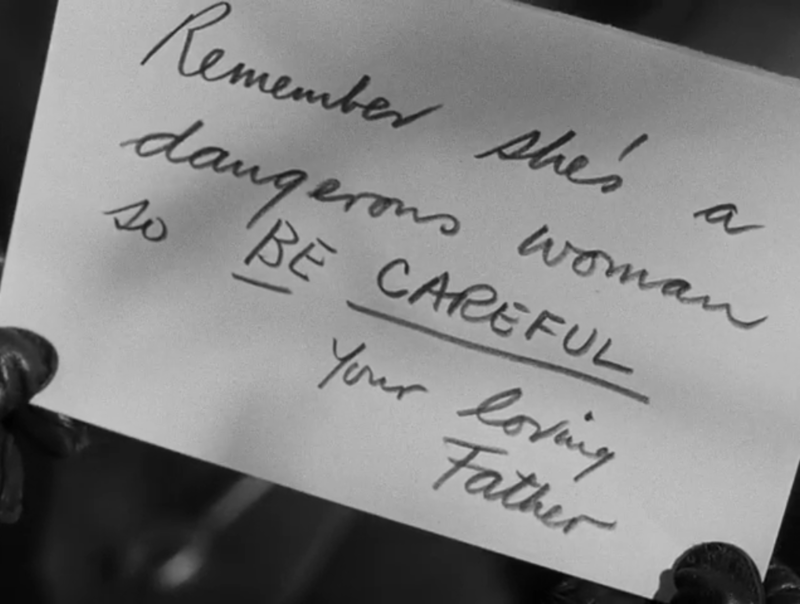 Hitchcock tricks us again and again throughout the film, beginning with that very first flashback. These techniques, particularly the “false flashback,” are not well-loved by many viewers… but being the odd duck viewer that I am, I found all of the lies to be the best part of the film. It really took away any of the predictability that the story would have had if all of my assumptions based on the flashback had been true. I really like Wyman in this role. I think she’s the perfect foil for Dietrich and because it’s Jane Wyman, the ending is that much more of a surprise. I first saw this years ago, and like you was surprised by all the negative feedback it’s garnered…I thought it was pretty good! 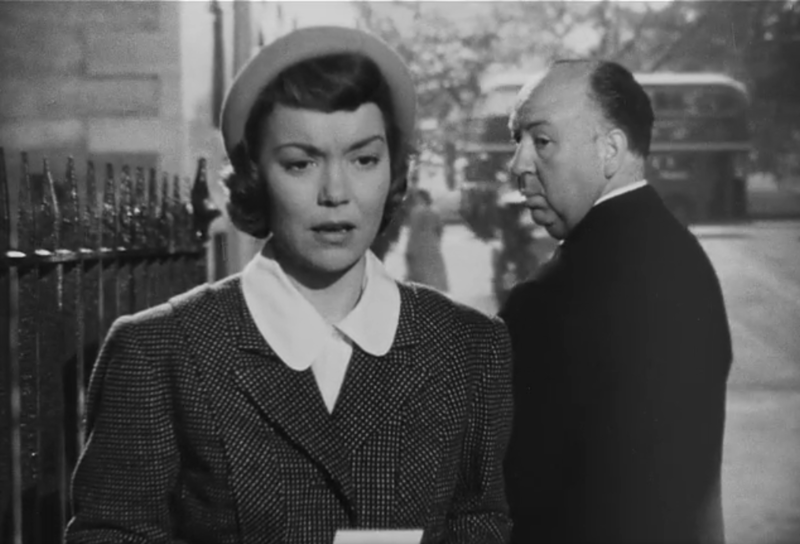 And I love the ‘stink eye’ comment about the Hitchcock cameo…I’d have to think about what my favorite Alfred appearance would be. I always get a kick out of him running up to that bus in North by Northwest, so for now that’ll be my number one! My favorites are Blackmail (with the kid pulling his hat over his eyes on the train), Lifeboat (in the “obesity slayer” ad) and North by Northwest. The Stage Fright cameo ranks pretty high up now that I’ve seen it, though. Maybe I should make a post ranking Hitchcock’s cameos! That would be an awesome post! I thought the one for ‘Lifeboat’ was very clever…have you ever seen the one for ‘Torn Curtain’? Funny in a total Hitchcockian kind of way. And of course, the moment with Cary Grant on the bus in ‘To Catch a Thief’ would have to be highly-ranked, too. Back when I was a true member of the 21st century and had a Facebook account the cameo from To Catch a Thief was my cover photo. That one would definitely be high up. I love the one from Torn Curtain, too, especially because they play the Alfred Hitchcock Presents theme during it! Good catch! I’m now tempted to just watch that one scene, and save the movie for later! Thanks, I just watched it…very fun! And yes, I heard the quick bit of the theme from Alfred Hitchcock Presents…and I’d forgotten how much fun the wheelchair cameo from Topaz was!